Though undoubtedly not the first time Vilsack had uttered the phrase, his use of it in the setting of the Midwest’s leading annual event promoting locally and sustainably produced food was profound — an affirmation from the highest levels of the U.S. government that the demand for a healthier, more environmentally sustainable and more economically dynamic food system has mass appeal. USDA, in fact, reports that it invested more than $1 billion between 2009 and 2015 in nearly 40,000 local and regional food businesses and infrastructure projects. So it is not a surprise that Vilsack is comfortable enough with the phrase “Good Food movement” to use it three times in a speech of about 20 minutes long. “All of this work is important and necessary for us to continue to create the supply chain that will allow this Good Food movement to continue to expand and grow,” Vilsack said. He then described a brand new USDA product, created in conjunction with Colorado State University and released that day, called the Economic Impact Assessment Toolkit. 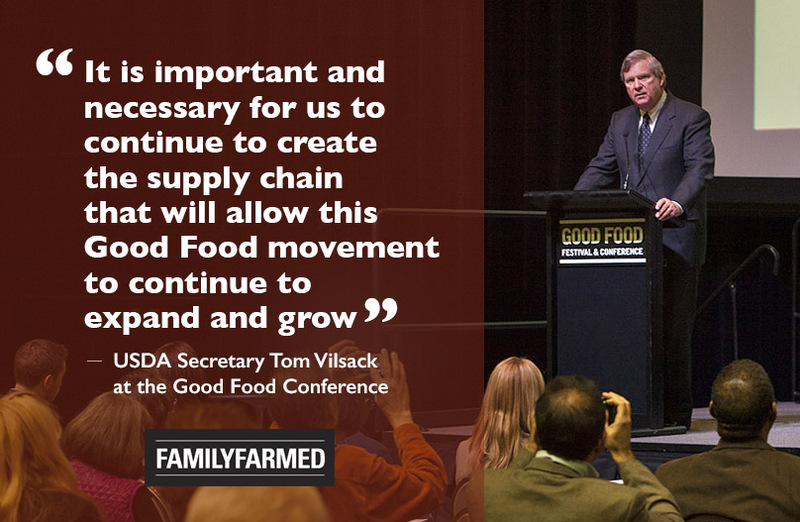 Apart from this strong acknowledgement of the Good Food movement, Vilsack’s address was a historic moment for FamilyFarmed. 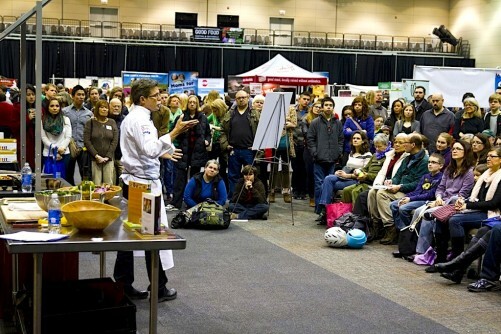 While the fast-growing public interest in Good Food has drawn a number of leading policymakers to FamilyFarmed’s Good Food Festival & Conference, Vilsack’s visit was the first by a U.S. Cabinet member. USDA has, in fact, developed a wide range of programs that work to the benefit of farmers (both experienced and new), food processors, buyers and consumers who produce, make and purchase Good Food. And the greatest surge of development has occurred since 2009, when President Barack Obama began his first term in the White House and appointed Vilsack, a former governor of the farm state of Iowa, to head USDA. The article below summarizes the remarks by Vilsack and the USDA officials. To view the Secretary’s full speech, please click on the video below produced by FamilyFarmed’s Jamie McCarthy. USDA’s interest in promoting the growth of the local and sustainable food sectors obviously goes way beyond its partnerships with FamilyFarmed. Yet Vilsack, in his speech, said he felt the need to shine a brighter light on the department’s efforts in this sector. “I find in many audiences that I speak to that there is not a clear understanding of everything that USDA does,” Vilsack said. His remarks focused heavily on USDA’s efforts to help producers build capacity. 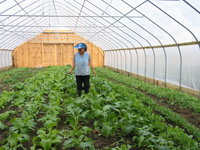 One program he touted strongly is administered by USDA’s Natural Resources Conservation Service and provides farmers with financial assistance to build “high-tunnel” greenhouses, covered growing spaces that protect crops from the elements and — especially in northerly areas with shorter outdoor growing seasons — better enable farmers to serve their local markets closer to year-round. Vilsack noted that the first program developed under his tenure to address needs of smaller producers was a microloan program administered by the Farm Service Agency. The loan limit was initially set at $35,000, but the program proved so popular and effective that Congress raised the limit to $50,000 in the 2014 Farm Bill. Vilsack said nearly 18,000 farmers have taken advantage of the program since its inception in 2009. Those receiving low-income food assistance under the Supplemental Nutrition Assistance Program (SNAP) program can now use their benefit cards to purchase locally produced vegetables and fruit at about 6,400 of the nation’s farmers markets, up from fewer than 1,000 when Obama took office. Vilsack said that, as a result, SNAP redemptions have increased from $3 million in the 2008-09 fiscal year to about $20 million in 2015. During a 20-minute speech, Vilsack also announced the new USDA Economic Impact Assessment Toolkit, and touched on USDA efforts that provide market-price-based crop insurance options for organic growers instituted under the 2014 Farm Bill, and offer cost-share options to help farmers transition from conventional to organic growing; help build entrepreneurial opportunity through the Value-Added Producer Grant program and assistance to food hubs; expand the amount of local foods provided to children through the Farm to School program; create directories to help locate farmers markets, Community Supported Agriculture (CSA) operations, on-farm retail outlets, and food hubs; develop data resources to help farmers determine how much to charge for their products; and work to reduce food waste in the United States through collaboration with other federal agencies. • Alston emphasized the benefits to organic producers of the recent introduction of contract pricing in determining reimbursements under the crop insurance program: “That means for those organic producers, if you have a contract, your guarantee will be based on that contract price… We understand that organics is highly labor intensive. We also understand the price point for organics. • Rikkers underscored that there are financial set-asides in some of USDA’s programs, including one that dedicates funding to local and regional producers under the Business & Industry Loan Guarantee Program and another that sets aside money under the Value-Added Producer Grant program for new and beginning farmers and for farmers who are military veterans. A partnership between USDA, the Appalachian Regional Commission, the Delta Regional Commission and 15 philanthropic organizations, Food LINC will initially use $750,000 in public money to leverage a total of $3 million in investment. To learn more about the full range of USDA programs and grants to promote local, regional and sustainable food production, the department provides its “Know Your Farmer, Know Your Food Compass” on its USDA.gov website. Much of FamilyFarmed’s collaboration with USDA has focused on providing farmers with information resources and training that enables them to improve their production, harvest and postharvest handling, food safety, and marketing skills. 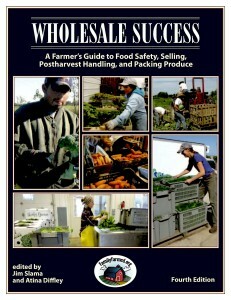 USDA and its Risk Management Agency have partnered with FamilyFarmed on workshops based on the organization’s 315-page Wholesale Success manual aimed at small to medium-sized producers who sell into wholesale markets. Under this program, FamilyFarmed has trained more than 9,000 farmers in 40 states in best agricultural practices. “We have worked together to establish a program that focuses on better understanding of the wholesale market, the technical assistance that’s necessary for success there,” Vilsack said at the conference. FamilyFarmed also has partnered since 2010 with the Risk Management Agency on the On-Farm Food Safety Project, an online tool that facilitates efforts by small and mid-acreage fruit and vegetable farmers to comply with national best practices in food safety. The project, introduced at USDA headquarters in Washington, D.C. by then-Deputy Secretary Kathleen Merrigan, has become even more valuable to farmers, who face new regulatory requirements under the federal Food Safety Modernization Act and pressure from trade buyers to obtain food safety certification, and USDA is supporting technological and content improvements to the site. USDA and FamilyFarmed also are working together to help food and farm entrepreneurs establish and scale up their business to increase the market for and the availability of Good Food products. The Agricultural Marketing Service’s Local Food Promotion Program was a lead funder of FamilyFarmed’s Good Food Business Accelerator, a Fellows program for nine competitively selected entrepreneurs located in the Chicago foodshed with an intensive six-month curriculum, technical assistance, networking opportunities and connections to Good Food business financiers and lenders. The Accelerator is based at 1871, Chicago’s center for entrepreneurial innovation, which is located in the city’s historic Merchandise Mart. 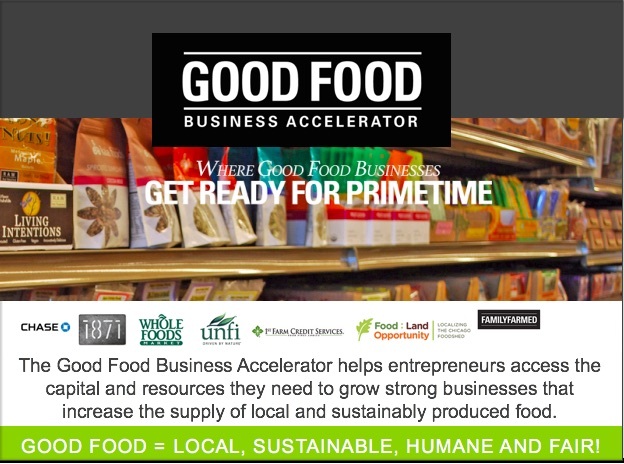 FamilyFarmed’s Good Food Business Accelerator was founded in 2014 with lead funding from the USDA Agricultural Marketing Services Local Food Promotion Program. Two of the competitively selected Fellows in the program, Living Water Farms and The Cider Farm, have received direct assistance from USDA Rural Development’s Value-Added Producer Grants program. The USDA has furthermore provided monetary grants under its Value-Added Producer Grants program to two businesses that have participated in the Good Food Business Accelerator: Living Water Farms of Strawn, Illinois, which is seeking to greatly expand its indoor growing facilities for herbs and microgreens, and The Cider Farm of Mineral Point, Wisconsin, which produces heirloom apples and uses them to produce hard ciders and a Calvados-style apple brandy. FamilyFarmed was funded by the USDA Farm to School grant to help Chicago Public Schools more fully develop its local procurement program. In the past five years, CPS has purchased more than $13 million in food from local farmers. CPS is now sourcing antibiotic-free chicken from an Indiana Amish farmer, the largest purchase of its type in the U.S. CPS has worked with school districts in New York City, Los Angeles, Houston and Miami to encourage them to source antibiotic-free chicken. FamilyFarmed also partnered with CPS on “Eat What You Grow,” a school garden food safety project. Together, we created a school garden manual and training materials that allow CPS cafeterias to source produce from their own school gardens. FamilyFarmed also is a leader in food hub development and has done extensive work researching and developing facilities that aggregate and/or process food. 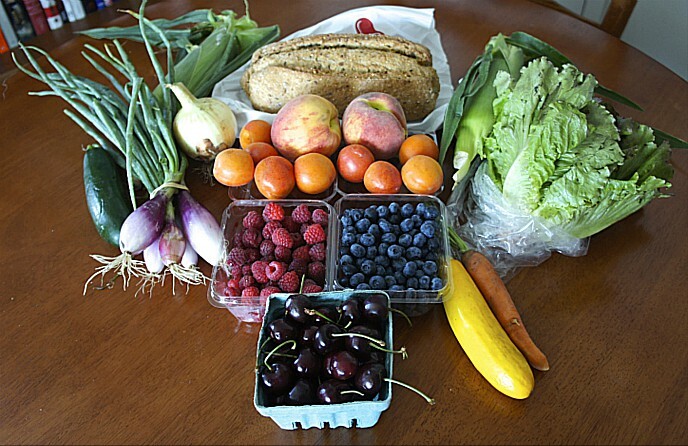 FamilyFarmed has helped launch Blue Ridge Produce in Virginia and the Wisconsin Food Hub Cooperative. Additionally, with USDA funding, FamilyFarmed published Building Successful Food Hubs: A Business Planning Guide for Aggregating and Processing Local Food in Illinois, a “how to” guide for entrepreneurs. Currently in the works is Food Safety for Food Hubs and Their Farmers, a technical assistance publication being produced in partnership with the USDA Agricultural Marketing Services. This entry was posted in Family Farms, Farm Bill, Farm to school movement, Farmer training, Farmers markets, Financing, Food access, Food activism, Food and community, Food assistance, Food Entrepreneurs, Food Hubs, Food policy, Food safety, Good Food and economic development, Good Food Business Accelerator, Good Food business development, Good Food Festivals, Local Food, School food and tagged 1871, FamilyFarmed, Good Food Business Accelerator, Good Food Festival & Conference, Tom Vilsack, U.S. Department of Agriculture, USDA, USDA Agricultural Marketing Service, USDA Risk Management Agency, USDA Rural Development, Wholesale Success. Bookmark the permalink. While I totally appreciate the work that FamilyFarmed is doing, this article feels at little like green-washing. The USDA gives FAR more than $1 billion in assistance to conventional farmers through subsidies, crop insurance programs, etc. Furthermore, Sec. Vilsack has been heavily lobbying for a ridiculous watered down voluntary QR code GMO labeling scheme. And yet he’s totally off the hook in this article for any of this. The assistance that USDA has given small local and organic farmers is great. But they could be doing so much more! I think we need to do a better job of holding agency heads such as Sec. Vilsack accountable. He can’t just give a good talk in Chicago. He should be giving that talk and walking the walk every day from D.C.